A fantastic evening of “Spook” Tacular entertainment with M.C. 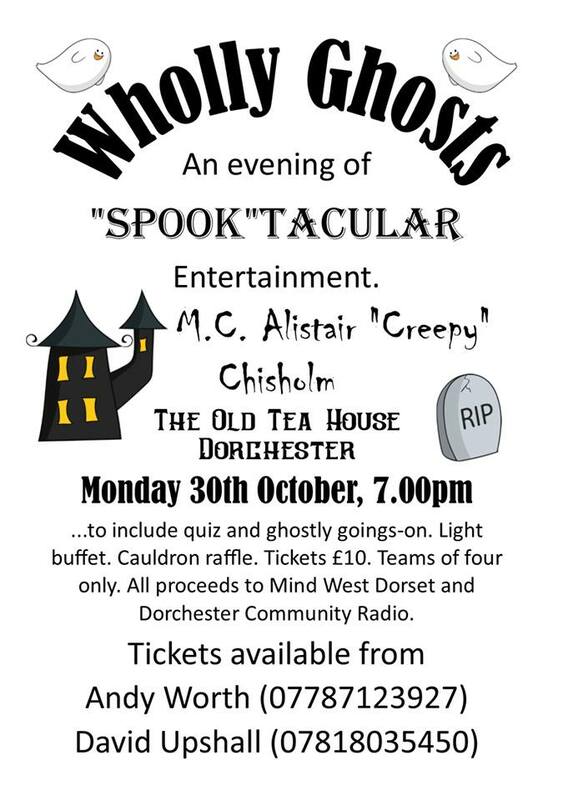 Alistair “Creepy” Chisholm was held at The Old Tea House, Dorchester, on Monday 30th October. The very full house thoroughly enjoyed a quiz, ghostly goings-on, a Cauldron Raffle and a ‘suitable buffet’ provided by Dangerous Debbie, our wonderful g’host. The ghastly quiz was devised by Anita ‘orrible ‘arries. The evening raised a total of £560 to be shared between Ridgeway Community Radio and Mind West Dorset, which exceeded the hoped-for amount. With many thanks to all who attended, our hosts at The Old Tea House and, of course, the ‘orrible organisers.